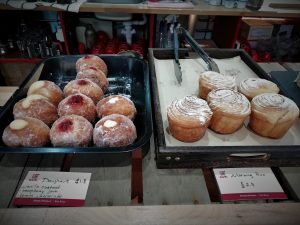 Dale End probably isn’t the first place you would think of to open an Artisan Bakery, is it? But Orientee is hoping to change opinions on that! 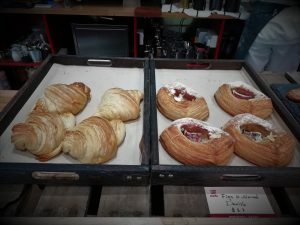 After following them for a few months on Instagram, ooh-ing & aah-ing at their oh so lovely pics of bread & pastries, I was pleased to see they finally had an official opening date of 17 September. 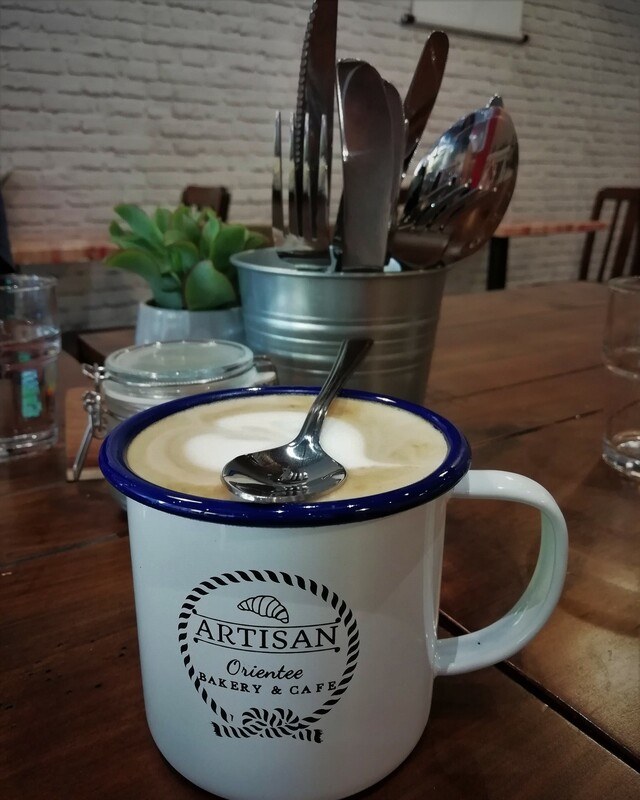 Last week, I popped along to their soft launch for foodbloggers / foodies. It’s just a few doors down from the Peaky Blinders bar, under the ramp part of Priory Square. My lunch date was Geeky Brummie crew member and freelance writer @philipellis. 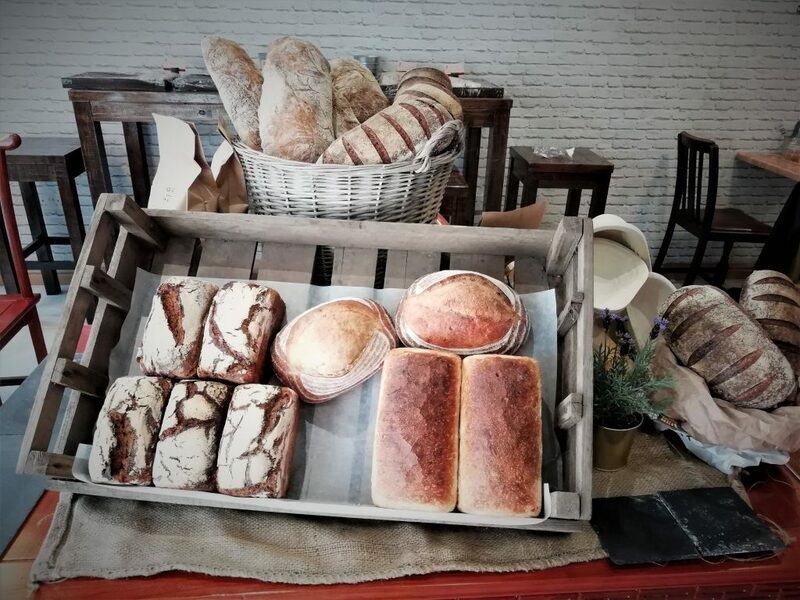 The moment you walk into Orientee, you are welcomed by friendly staff and the irresistible smell of freshly baked bread, both signs that this is a place where you can relax and feel at home. 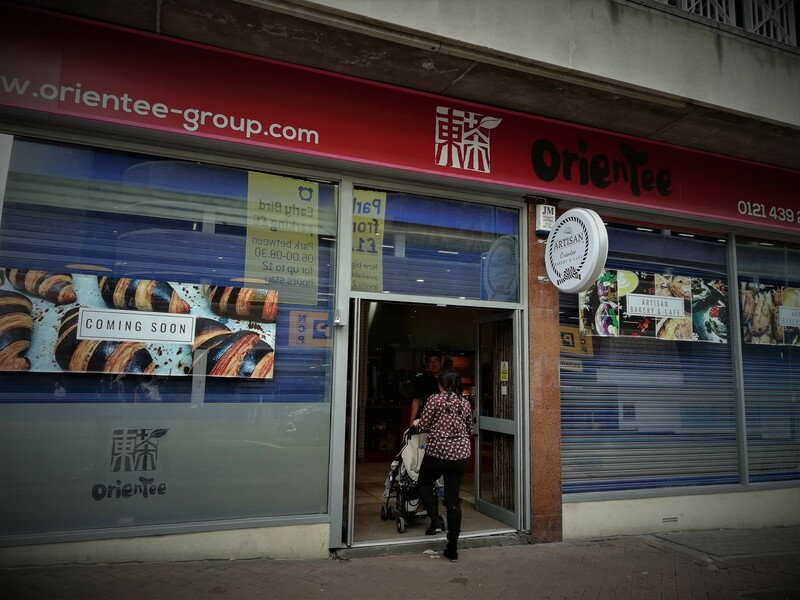 And with the promise of authentic Chinese pastries (they sadly weren’t ready in time for the opening), I’ll be adding Orientee to my list of Birmingham cafes that are perfect to sit with a book, a cuppa and a treat. 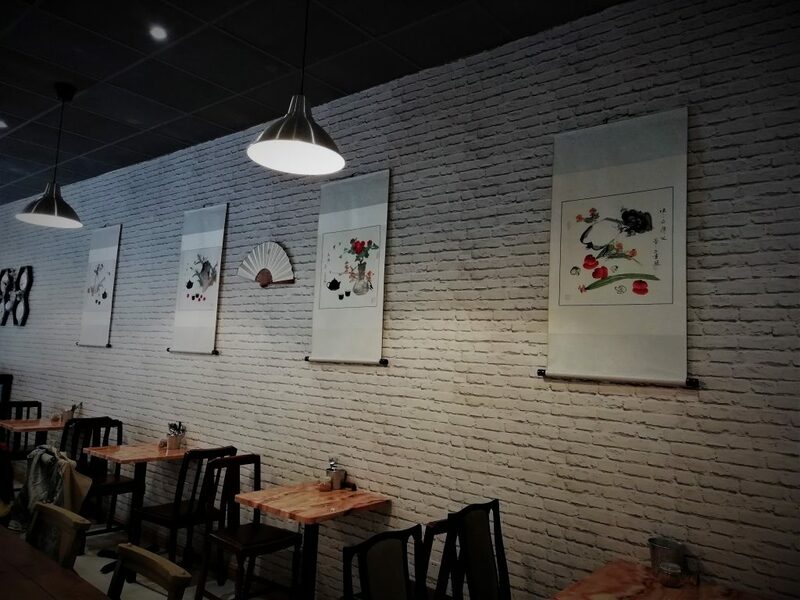 Having decided where to sit, menus were popped down and we had the chance to admire the simple chic interiors: hand painted wall scrolls, not too dis-similar to ones that hang in my parents’ home, placed against faux brickwork wallpaper. I felt the need to go and touch it, after Phil asked it was actual open brickwork; got me fooled! Anyway onto the food and drink, which is probably why you’re reading this. 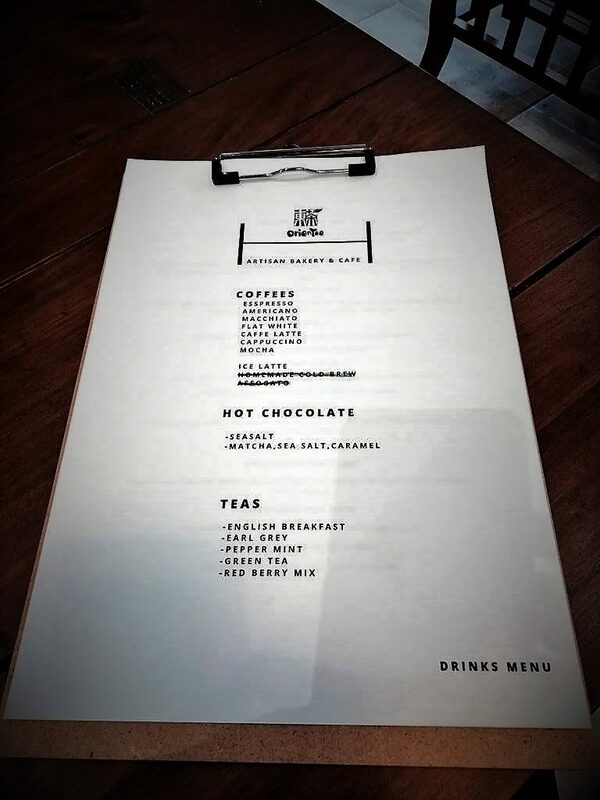 They have a good selection of brunch dishes and hot drinks. I ordered a flat white (my usual) and Sweetcorn Fritters, one of Orientee’s vegetarian options. Whilst waiting for the food, we caught up on what we’d been up to during the week. The food arrived and we tucked in. My Sweetcorn Fritters were sweetcorn, courgette, red pepper and spring onion, chilli jam, crushed beetroot, served with a minted yoghurt and a poached egg. 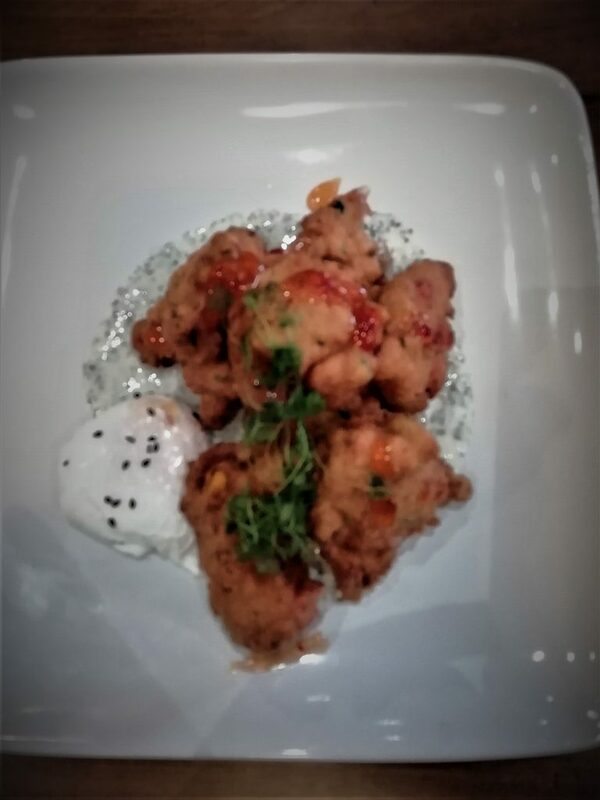 The fritters themselves were soft, light and piping hot, the hit of the chilli jam just perfect for my palate; the yolk of the egg oozing out beautifully. 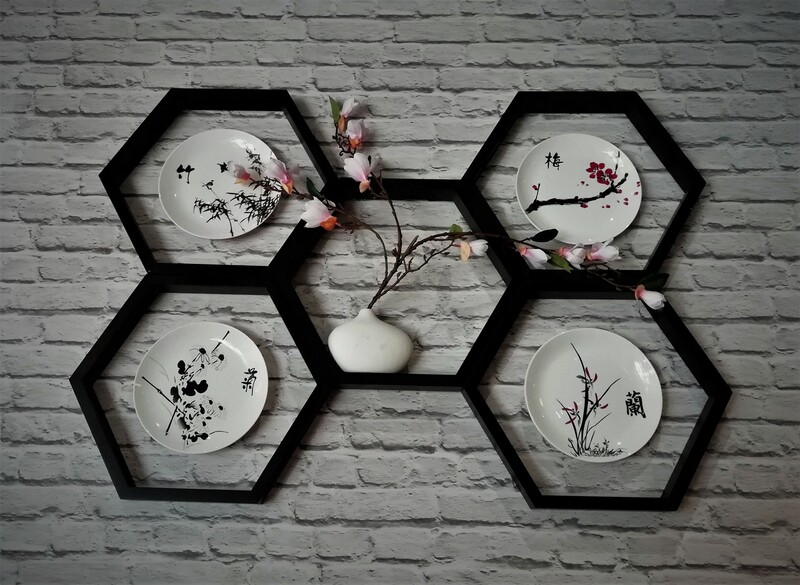 Phil’s choice was very pretty looking too. His thoughts? 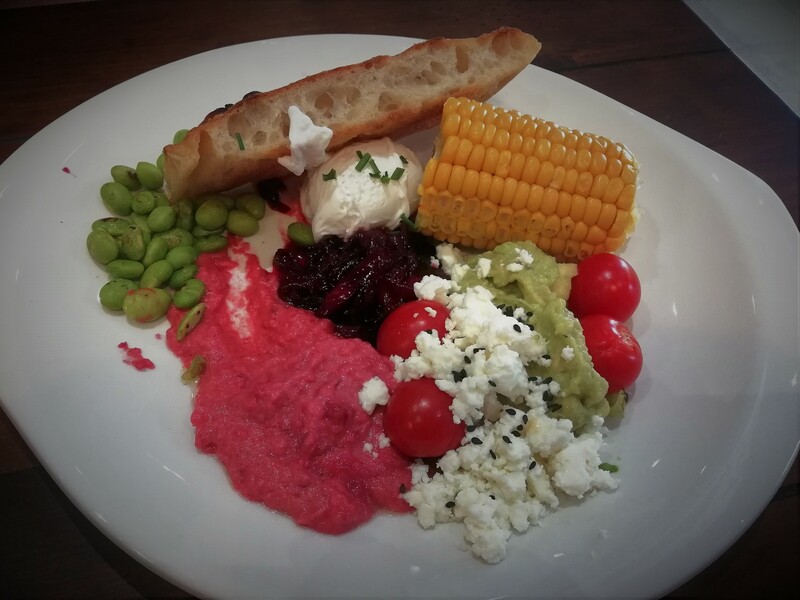 I went for The Rejuvenator, a colourful, light and tasty mix of edamame, beetroot, avocado, feta and hummus, complete with a poached egg and freshly baked focaccia. Virtuous and extremely satisfying, washed down with a rich and earthy Matcha and Sea Salt Hot Chocolate. There are options to add bacon, salmon and extra halloumi or make it vegan, by replacing the feta and egg with crushed beets and extra corn. 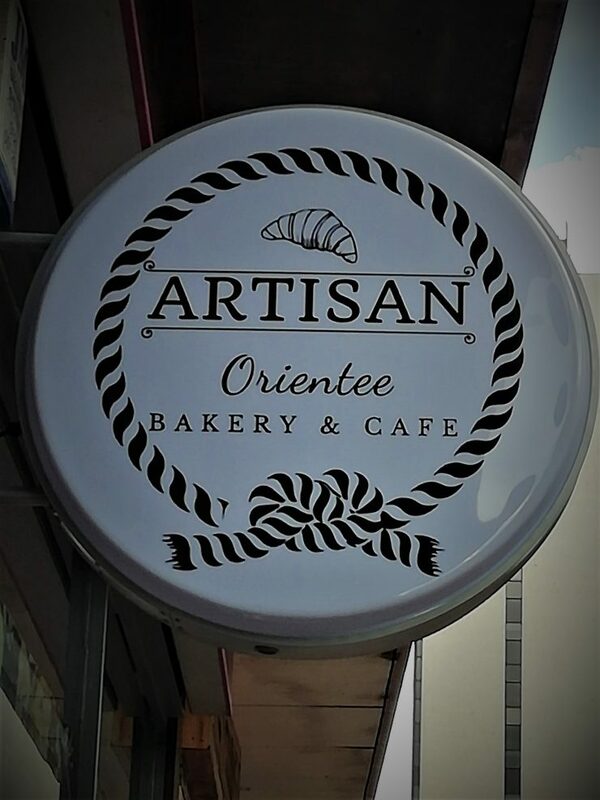 Orientee’s breakfast and brunch choices cater for all palates. 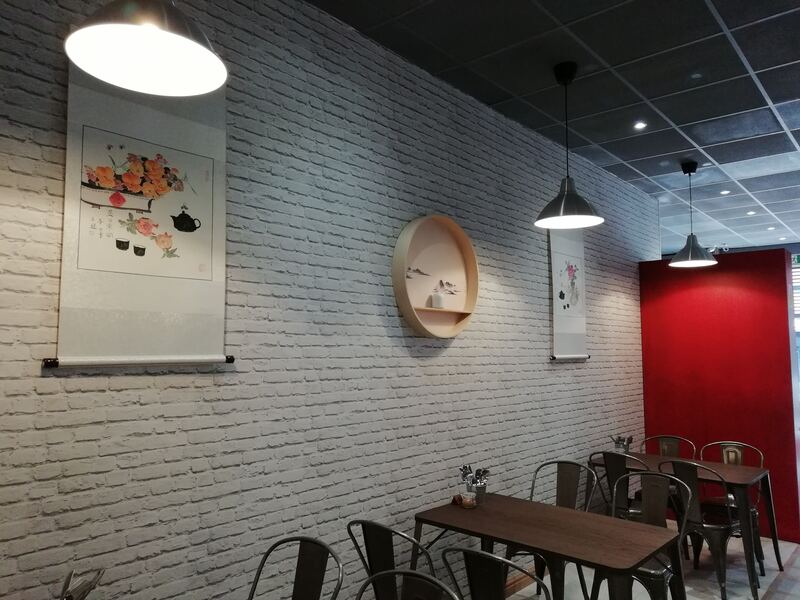 Given the traffic running past on a regular basis, the calm interiors is enough to escape the High Street for awhile if you’re out shopping or even wanting somewhere quiet to work. 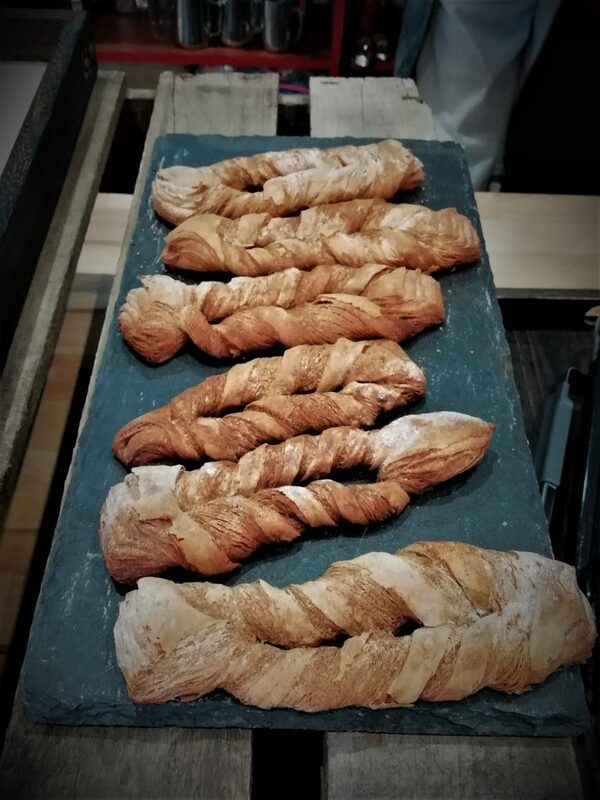 Upon leaving, one of the bakers popped out to say hello and told us about the different breads they make ranging from Russian Rye to Italian Foccacia. 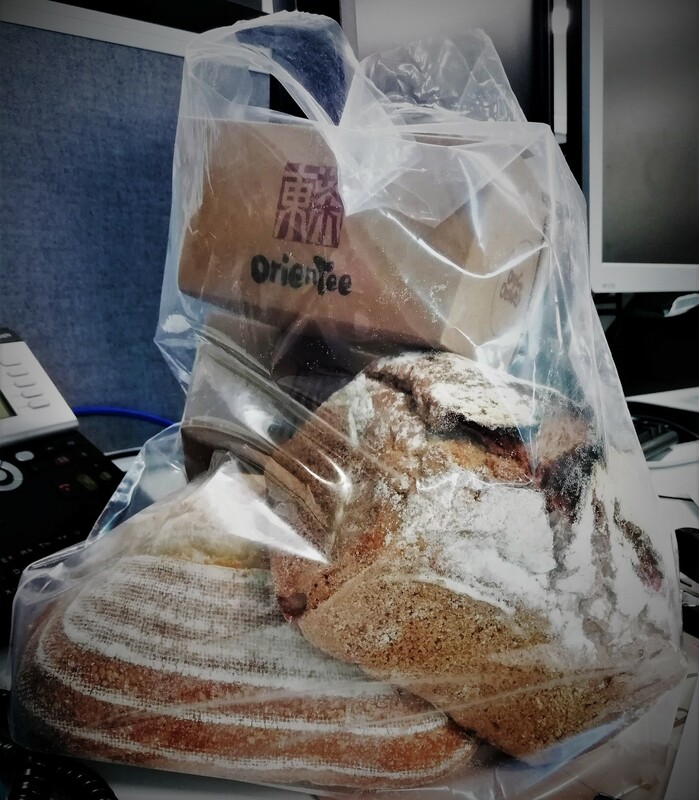 We were invited to take away samples of the breads to try at home, which I can confirm were delicious. A couple of colleagues at my office tried them, and Ryan and I had them for dinner later that evening with soup. The pastries weren’t quite ready during my first visit but I stopped by during my lunch break when they officially opened with #BrumHour. 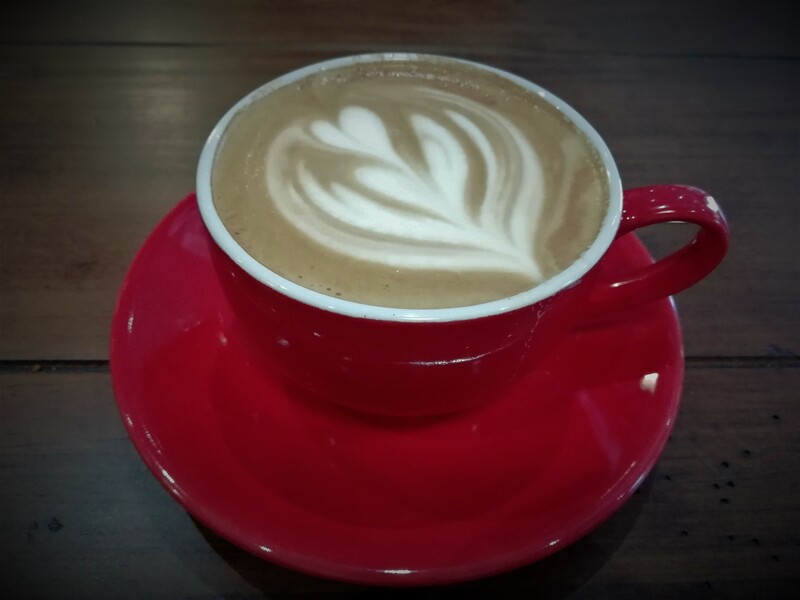 I thought I’d try the latte this time while Dave had the peach oolong tea. 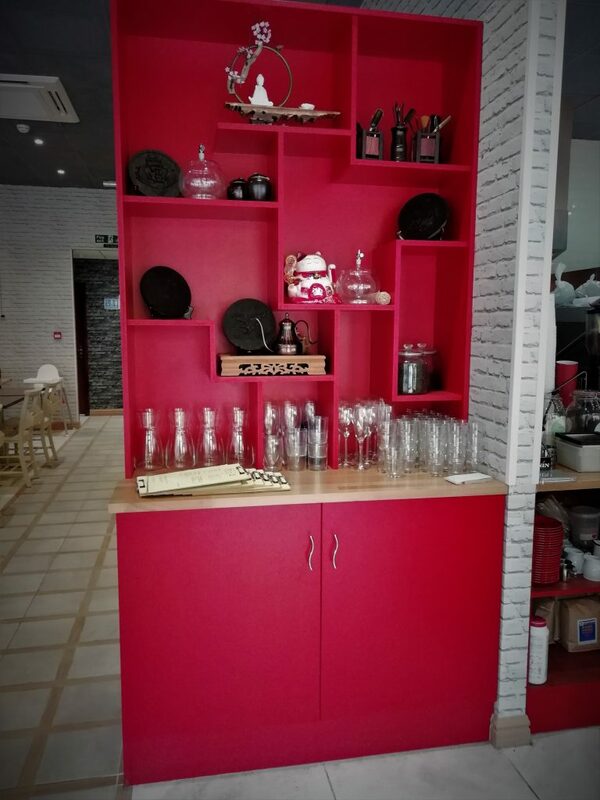 Their proper menu includes soft drinks, and there are separate breakfast and lunch menus. 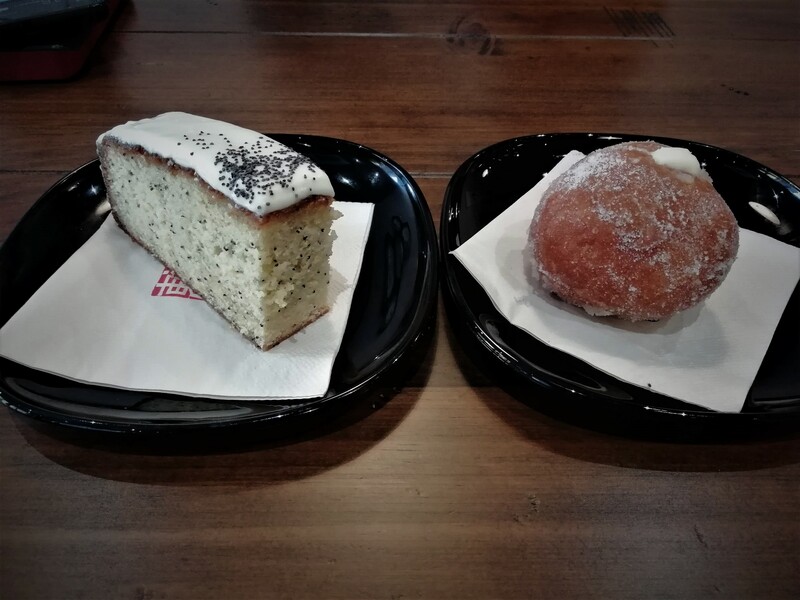 We also chose some sweet treats: me a Lemon & Poppy seed slice with cream cheese icing, and Dave a Lemon Cheesecake doughnut. He also went for the avocado on sourdough toast, which was very crunchy and he devoured it…..after his doughnut! My cake was light, not too sweet and moist. 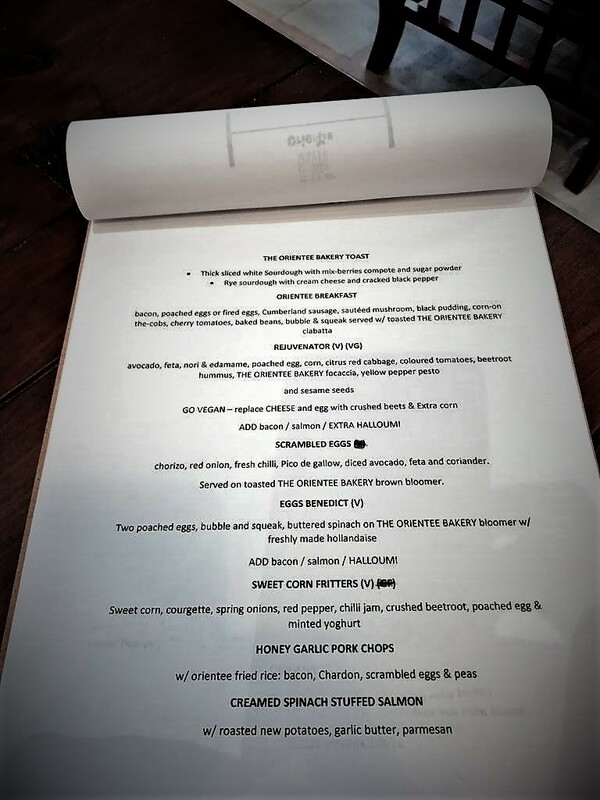 You know I will be returning to try the rest of the menu…and the cakes.